Australia’s favourite spectator sport is at least partly derived from an Indigenous game. Wintry Saturdays decades ago when the whole district trooped to the footy to cheer on our country team, Heywood, we knew we’d see miracles performed by the Lovetts – Jacky, Billy and Wally. They were naturals, everyone said. And perhaps they were. Football was, in a fundamental way, their game, though they and their families often had to walk 10km from their home by a creek to the ground as if they were strangers. 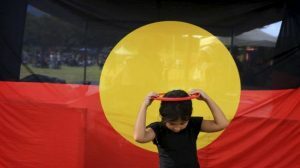 Truth is, long before we had a game we called our own, Indigenous Australians – the ancestors of Jacky and Billy and Wally – played a game with a ball that was kicked. It came complete with high leaps to drag the ball out of the sky accompanied by the call of “mumarki”, which means “catch”. The original players formed into two teams identified with their totems – the crow, the cockatoo, the tiger snake, the pelican – and the game went on all afternoon. Familiar ? It was called Marn Grook, or plain marngrook, across Victoria, and other names elsewhere. There never was a spelling. It was played before strangers came with an alphabet. The first observation of an Indigenous ball game was made in 1798 by David Collins, who had arrived with the First Fleet as the colony’s first deputy judge advocate. 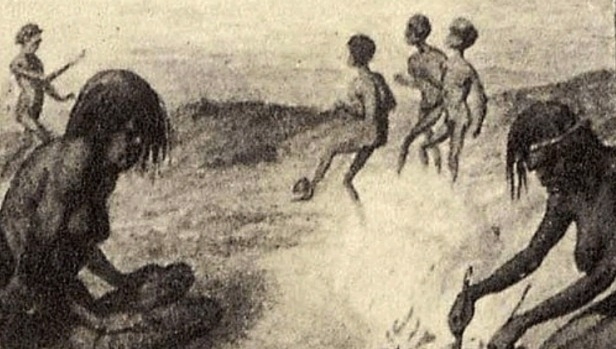 Then, in 1839, the first Protector of Aborigines in the Port Phillip District, William Thomas, wrote: “The Marn-Grook or Ball is a favourite game with the boys and men. One of the most lucid recollections of the game was given by James Dawson, an early pastoralist and a fine friend of Indigenous people in Western Victoria. “One of the favourite games is football, in which 50, or as many as 100 players engage at a time,” Dawson recalled in 1881, describing a sinew-bound possum-skin ball filled with pounded charcoal. “The players are divided into two sides and ranged in opposing lines,which are always of a different ‘class’ – white cockatoo against black cockatoo, quail against snake, etc. “Each side endeavours to keep possession of the ball, which is tossed a short distance by hand, and then kicked in any direction. The side which kicks it oftenest and furthest gains the game. “The person who sends it highest is considered the best player, and has the honour of burying it in the ground till required next day. Other early descriptions have men soaring 1.5 metres to take a “mumarki”. The earliest known picture of Aboriginal Australians playing their game was etched from a description by the German naturalist William Blandowski?, who founded the Geographical Society of Victoria in 1852. On an expedition across north-west Victoria, Blandowski recorded Indigenous people camped near Merbein, not far from Mildura, where Indigenous football was being played. “Aim of the game: never let the ball touch the ground.” Blandowski wrote. He made his notes in 1857 – a year before the first game of what became known as Australian football was played between Scotch College and Melbourne Grammar (with 40 a side, the game continued over three Saturdays and was declared a draw). 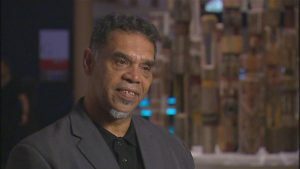 It remains debated whether Marn Grook was requisitioned and mixed with the traditions of rugby and soccer and the various anarchic forms of Gaelic football to become Australian football. Still, the man who set the codification of Aussie rules in motion in 1858, Thomas Wills, had spent much of his childhood among Indigenous people around what is now Moyston, near Ararat, and spoke the Djab Wurrung language before being sent away to Rugby School in England. Marn Grook with its kicking and high marking surely formed at least part of his thinking in giving Australia its own game. 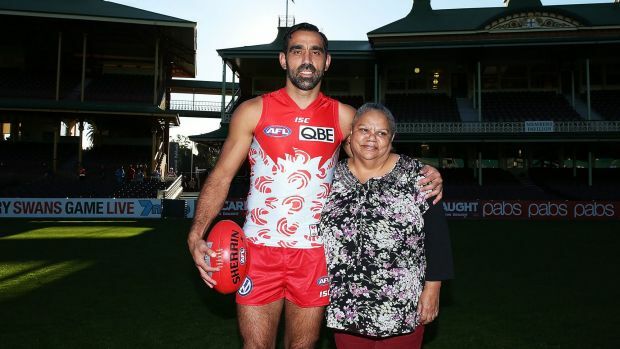 Whatever, 129 years after William Blandowski watched Indigenous people playing Marn Grook at Merbein, a young fellow named Adam Goodes moved to Merbein with his mother. And at Merbein West Primary School, Goodes began playing football himself. It was in his blood, you might say, but it was more than that – it anchored a strength of character that took him to Australian of the Year. The yobbos who now boo Goodes every Saturday – and who do it because of his blood – might reflect, should they be capable of it, about where their game came from, and where Adam Goodes and his people came from, and consider James Dawson’s last words about Marn Grook. “The sport is concluded with a shout of applause and the best player is complimented on his skill,” he wrote all those years ago.